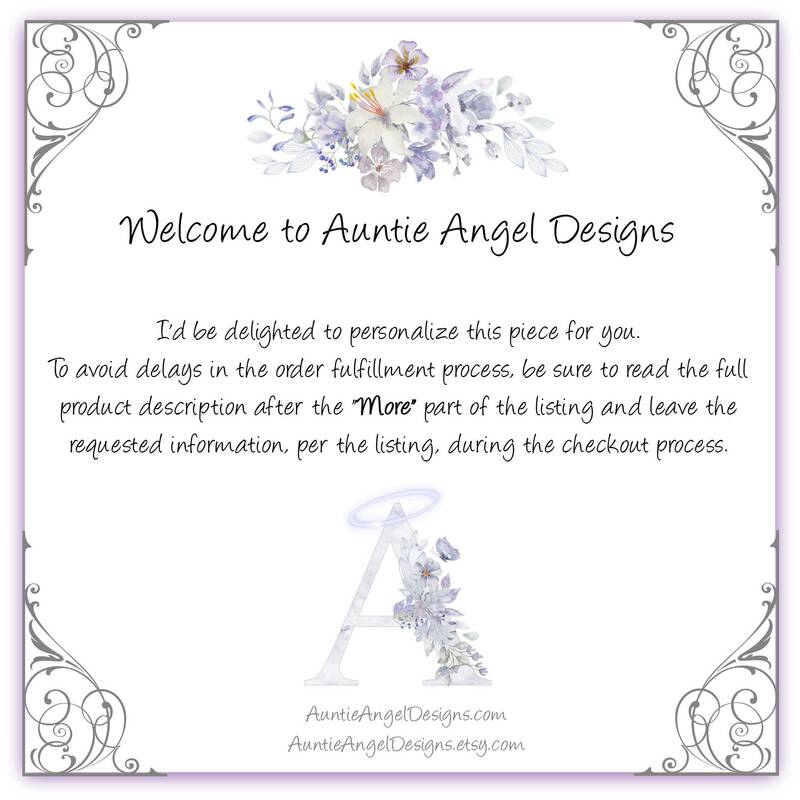 This Rainbow Bridge angel wings pet photo ornament is a unique and exclusive pet angel wings sympathy gift by Auntie Angel Designs that makes the perfect gift of remembrance all year long. 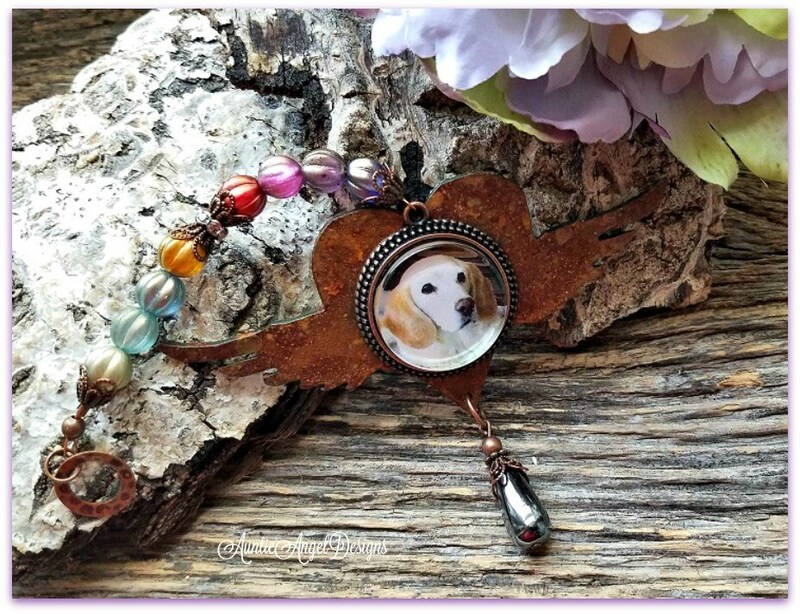 Cherish a photo memory of your beloved furry angel family member with this rusted steel piece lovingly created just for you. The hand-cut outer 16-gauge rusted metal angel wings heart cutout is 4" wide at its widest point and is 2" tall, with the thickness of about a quarter. It holds an antique-copper-finish decorative photo bezel with a 1"-diameter photo which is printed on high-quality acid-free paper. I use a clear glass over the photo glued into the bezel. 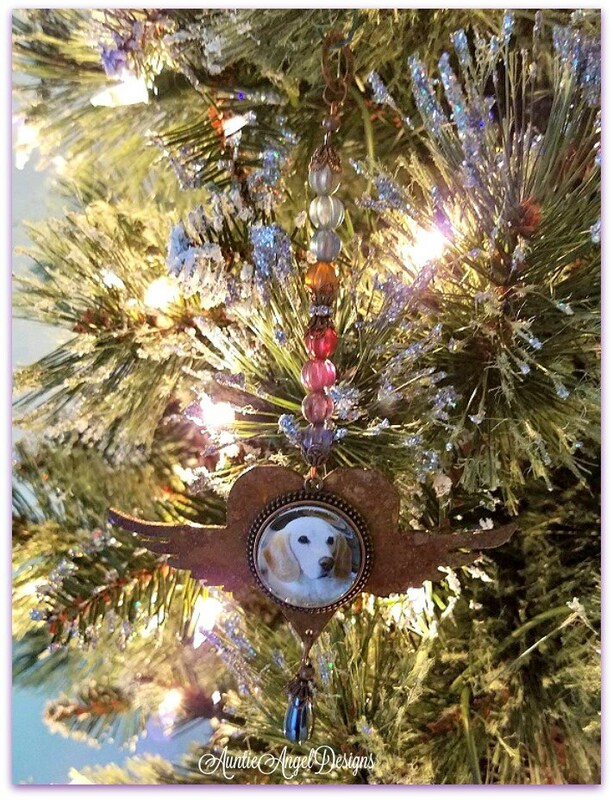 Your photo ornament keepsake dangles from a string of melon beads the color of a rainbow. I use decorative copper spacer beads, a copper rhinestone bead ring and beautiful antiqued-copper fine filigree bead caps to add a vintage feel to each ornament. Your ornament is finished with a hammered copper ring with a hematite bead dangle. IMPORTANT NOTE: On or about 11/7/18, the rainbow beads pictured in the photos are no longer available by the manufacturer and will be replaced by beautiful AB-finish crystal-faceted beads. We are sad to see these beads go, but we are excited for the change. Photos will be updated as soon thereafter as possible. Thank you for your understanding. This ornament's total beaded length is approximately 6.75" long. Your ornament is NOT meant to be displayed outdoors and is NOT water-resistant or waterproof. Each piece has been triple-coated with polyurethane to preserve the richness of the rust coloring, which varies from ornament to ornament. Some ornaments ARE more rusted than others. Please allow for slight variations in the hand-cut metal and note that there are rough edges and points and should not be played with by children. 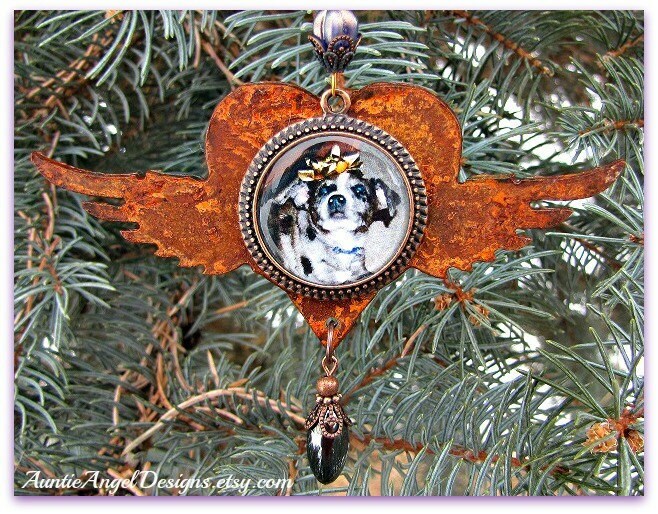 Use your angel wings sympathy rusted ornament as a wind-catcher focal, suspend with monofilament string (not provided) to a favorite shelving unit, or add an ornament hook (provided) and dangle this piece from a place of your choosing. 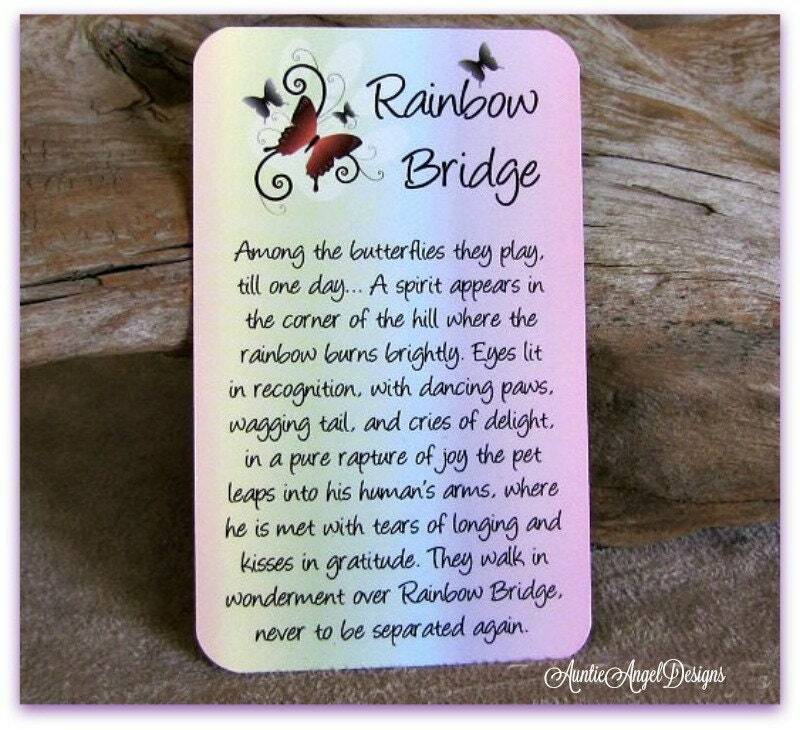 You will receive ONE ornament, lovingly gift-boxed with ribbon, with a copy of my version of a Rainbow Bridge wallet card. WHAT I NEED FROM YOU: Upon placing your order, please Convo me (Contact me through Etsy e-mail) three images, preferably no more than 4" by 6" photos, of your loved one. I am only able to use a head/upper-body shot that I will shrink down to a 1" circle. I will choose which is the best photo for your ornament. Please provide the best head shot of your loved one as possible. A poor-quality photo sent to me yields a poor-quality piece. PLEASE CONTACT ME BEFORE PLACING YOUR ORDER IF YOU HAVE ANY QUESTIONS WHATSOEVER! The ornament is beautiful! My friend is going to love it! We sent this to friends who had just lost their 15 year old dog. They said the absolutely loved it. The shop was so easy to work with and awesome customer service. I highly recommend! 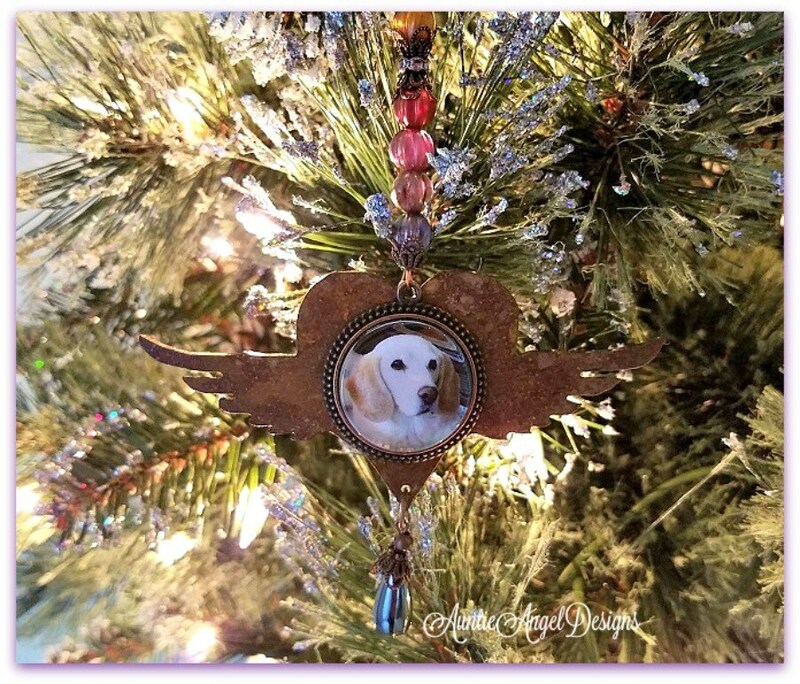 Beautiful ornament that captured my pet!